I had monkey bread for the first time when I was 31 years-old. I know, what the heck was I thinking? I was at my friend Erin’s house for a weekend away in Rochester and her delightful mother Suze made it for brunch. So when I was thinking of easy brunch recipes to impress the crowd, it was the first thing that jumped into my head. I gave it a little spin though — because why not? 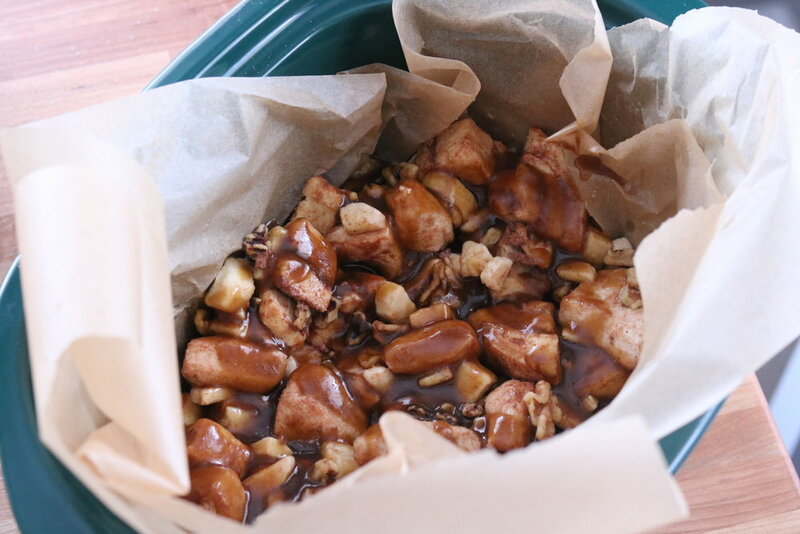 This banana nut monkey bread is the perfect addition to your brunch spread. And by using your slow cooker, you can free up some much-needed time to wash your hair or vacuum the floors. Or just sit on the couch and catch up on your favorite shows. Whatever floats your boat! Line inside of slow cooker with parchment paper. Open cinnamon rolls and biscuits. Separate each roll and cut into fourths. Set aside. Mix granulated sugar and cinnamon in mixing bowl. Roll each piece of dough in cinnamon sugar mix and place in bottom of slow cooker. Add in banana and walnuts. Mix melted butter and brown sugar together. Pour over dough. Place paper towels in between slow cooker and lid.